I love sets like this that include the music both in DVD and CD format. The CD actually includes a couple bonus tracks, too. 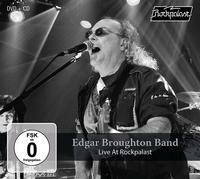 These Rockpalast sets always have good audio and video because they are filmed for German TV. This performance is a strong one that is quite prog oriented in a lot of ways. In addition to the concert itself, the DVD also includes an interview with the band.